The bodies of victims from crashed MH17 plane have been moved out of the rebel-held area in eastern Ukraine. The remains, carried by train, have arrived in the city of Kharkiv, outside rebel territory. Malaysia Airlines flight MH17 crashed in an area held by pro-Russia rebels on July 17, killing all 298 people on board. Meanwhile, international monitors say parts of the wreckage have been changed and cut into since they first saw them. Western nations say there is growing evidence the rebels shot down the plane using a missile supplied by Russia. Russia has suggested Ukrainian government forces are to blame. Most of those who died in the crash of the Malaysia Airlines Boeing 777 were Dutch, and the first remains are due to be flown from Kharkiv to the Dutch city of Eindhoven on Wednesday. From there, they will go to a facility in the Dutch city of Hilversum for identification – a process which could take months, Dutch PM Mark Rutte warned. 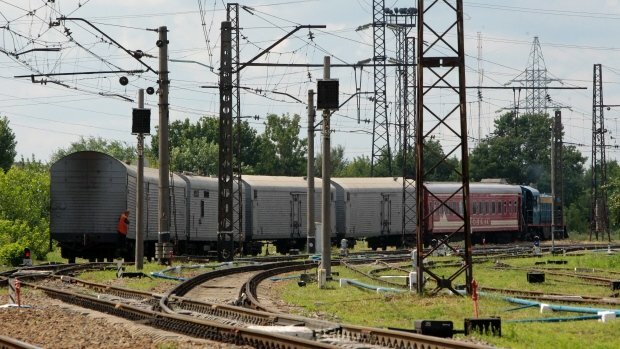 The bodies will be kept in refrigerated rail carriages in Kharkiv while they are being prepared for transport, a spokeswoman for the Dutch forensics team has said. European Union foreign ministers are meeting to consider further sanctions against Russia over its alleged backing for the rebels – something Moscow denies.